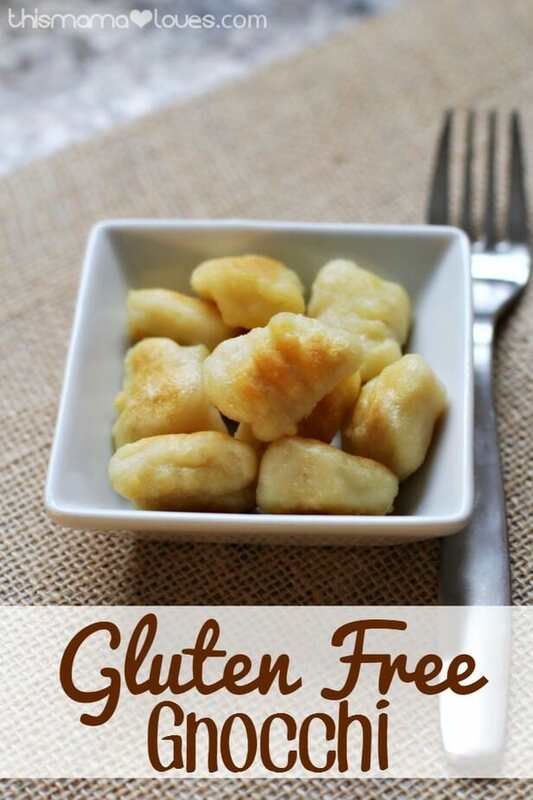 My family loves gnocchi but it’s one of those foods that is hard to find in a gluten free option available in the stores. Gnocchi, if you aren’t familiar, is like a potato dumpling. We like to think of them as these perfect, little potato pillows. Like most things we love, I experiment making our own homemade gluten free version. 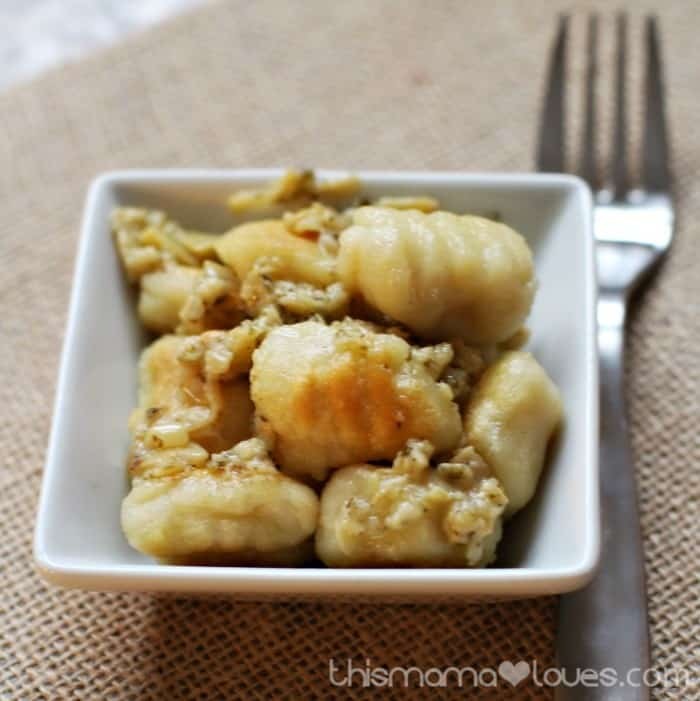 This Homemade Gluten Free Gnocchi was easy to make and turned out amazing! It’s a little time consuming to prep but easy enough that you can get the kids involved. Gnocchi is great served by itself, with various sauces, or even in soups. 2 Cups Mashed Potatoes – I used real mashed potatoes but I’m sure you could do this with a good instant mashed potato. Begin by placing 1/2 cup of your flour onto a clean, smooth work surface. Add the room temperature mashed potatoes to the flour. Use your hands to form a “well” in the potatoes. Whisk the egg and pour into the well. Add 1/4 of flour and the salt to the top before kneading the mixture to combine. 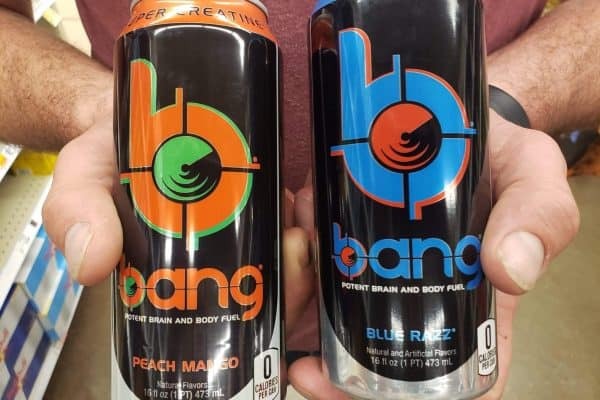 Be careful not to overmix. 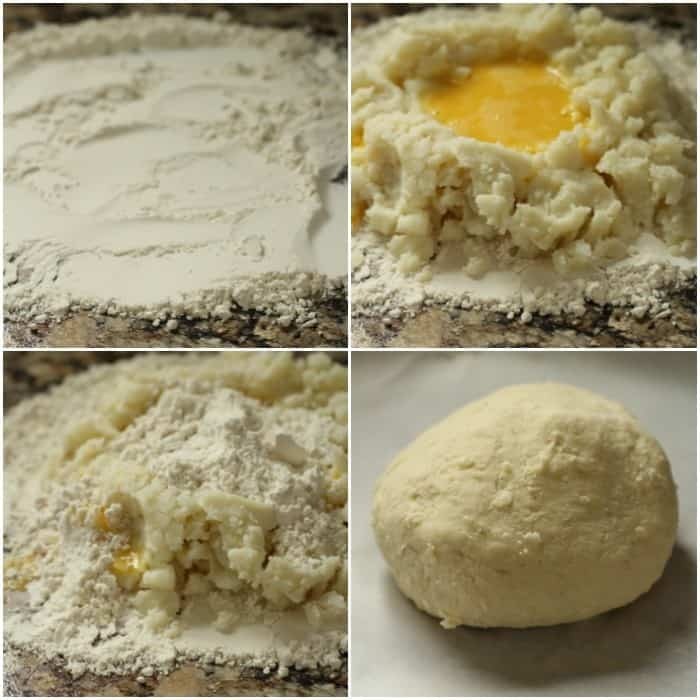 Divide the dough ball into smaller, more manageable pieces. Roll the dough out to create a cylinder approximately 3/4″ around. At this point I covered my surface with parchment paper to prevent sticking. Use a butter knife to cut the dough into 3/4″ long pieces. 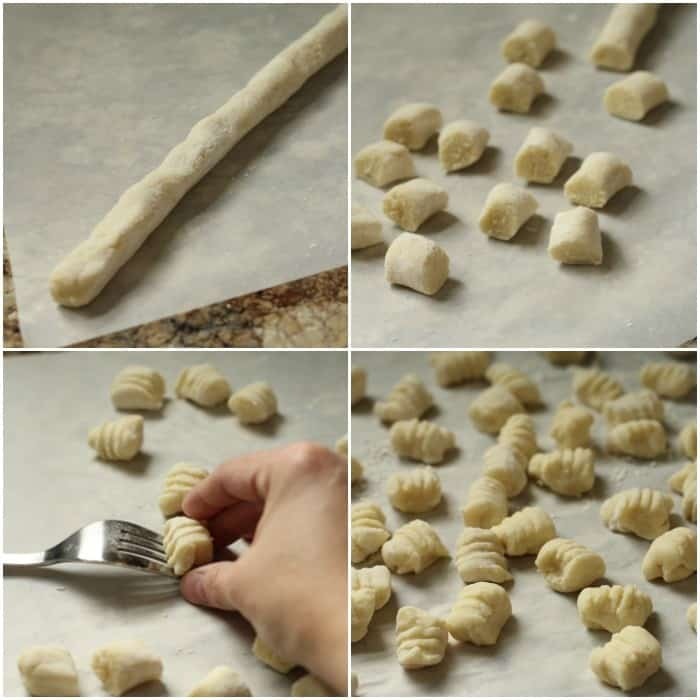 To give the gnocchi the lines you traditionally see, roll the dough pieces down the tines of the back of a fork. 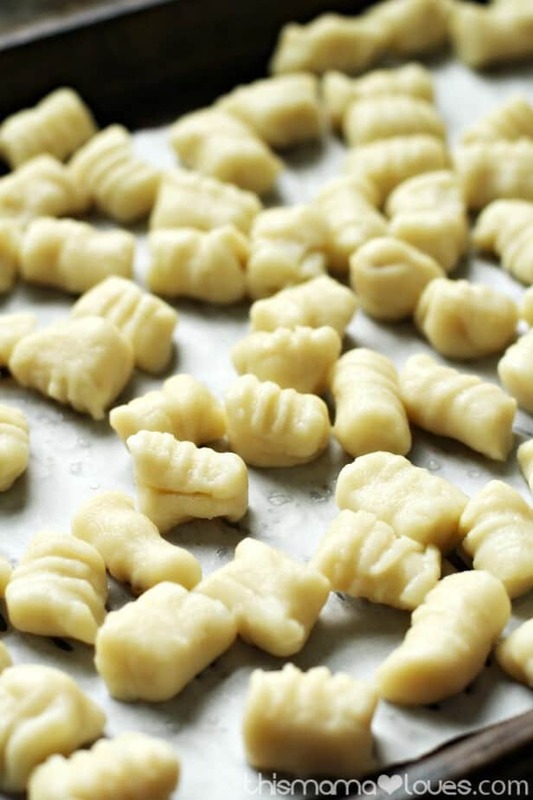 Once all your gnocchi is prepped you can either freeze it for cooking later or cook right away. To freeze, place in a single layer on a cookie sheet. Once frozen they can be placed in a freezer bag and returned to the freezer. To cook the gnocchi, drop them into a pot of boiling water. Continue cooking them until the float. Use a slotted spoon to remove them from the water as they rise to the top. You can serve them now plain, with a traditional red sauce or other sauce you like, or you can add them to soup. They can also be sauteed to add a little crispness to the outside. This is how we prefer them. Just heat a little oil in your skillet and cook them until they are golden brown. If you choose the saute method, serve immediately. You can just add salt and pepper to taste or top with your favorite sauce. I topped mine with an avocado, lemon pesto. Do you have a favorite way to serve gnocchi? My kids love potatoes and I’m sure they would enjoy these. 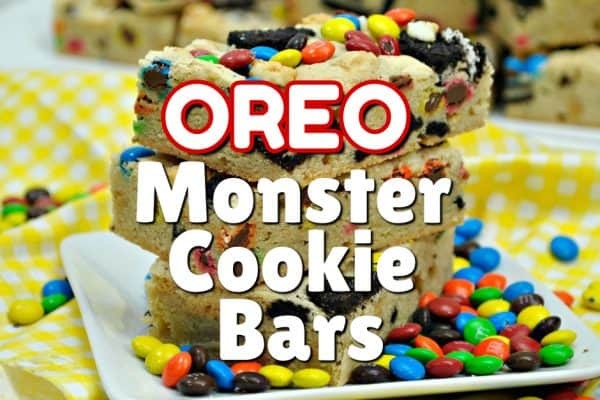 Seems easy to make and will try this. Thanks for sharing on Merry Monday. 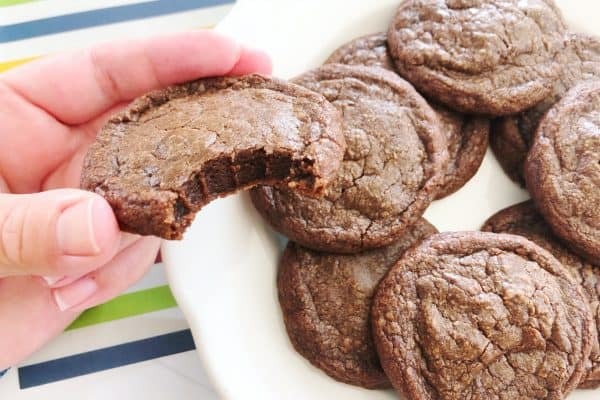 Just wanted to know if you noticed any difference in consistency using the Gluten Free Flour as opposed to regular flour. Did you have to compensate in any way? These Gnocchi looks delicious. Thanks for sharing the recipe. !